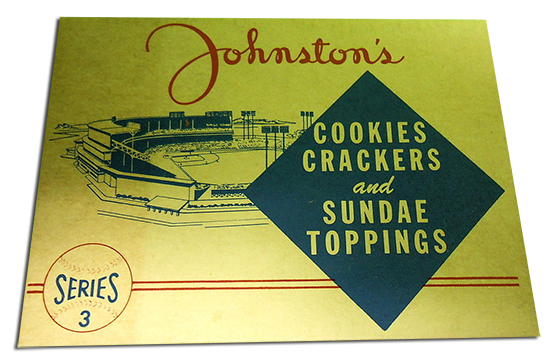 1955 Johnston Cookies Baseball marks the third and final set produced by the food company. 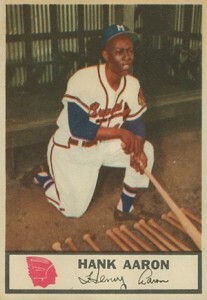 A popular regional set, it focuses exclusively on the Milwaukee Braves. The set has 35 cards. 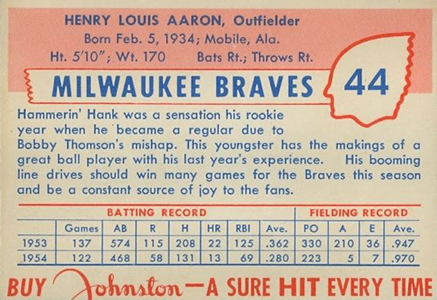 They're headlined by an early Hank Aaron card. 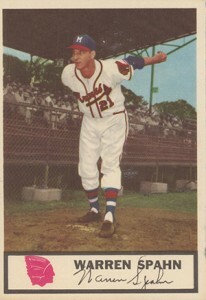 Other notables include Warren Spahn, Eddie Mathews and Andy Pafko. The set is skip-numbered because they reference the player's jersey number. Three unnumbered cards belong to the team's trainer, equipment manager and road secretary at the time. 1955 Johnston Cookies Baseball cards measure 2 7/8" x 4", making them a little bigger than traditional modern cards. They came in folders of six cards, or Series as they were referred to on the cards themselves. Panels were inserted in boxes of cookies. They could also be bought for a nickel through a mail-in offer. Pafko appears in two of the folders. He is the set's only double print. Because the cards were originally connected, they had to be cut by hand to be made into singles. As a result, many of the surviving cards might not have perfect edges. Those that are nicely centered with straight sides command premiums. 1955 Johnston Cookies Baseball is a fairly difficult set to put together today. They command strong prices, especially Aaron who can reach four figures with a high-grade copy from PSA or any other reputable professional grader. The following is a breakdown of the various six-card panels from 1955 Johnston Cookies Baseball.